Yes, you can use a single directory tree for all 4 list views in Quad-Explorer Q-Dir, it doesn't matter whether is it Windows 10 / 8.1 Server 2016/2012 or other Win OS! ► Disable the Windows Explorer file grouping in Q-Dir! ► Can I somehow disable the click navigation sound? ► Start Copy Paste in new Process! Please always use .... the newest and latest version of File Explorer Q-Dir! 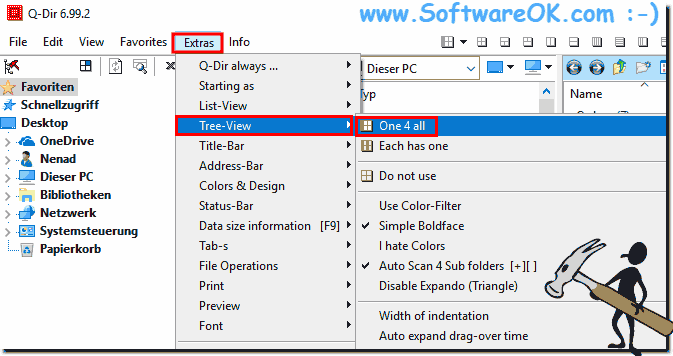 Q-DIR - FAQ-26: Has Quad-Directory Explorer a single tree that can be used for all panes? Quad-Directory-Explorer 3.31 and Windows 98 on 10? Has the Quad-Dir-Explorer fast access to frequently used programs? a single tree that can be used for all panes instead of separate treeviews for each, especially for the dual-pane mode. or is there already that option? i cant find it.